Jo Passed sprang from the ashes of Sprïng, a weirdo Vancouver art band who never really found their stride. But in Jo Passed, singer-guitarist Jo Hirabayashi has quickly found the alchemy he needs. Flanked by guitarist Bella Bébé and bass player Megan-Magdealena Bourne, wearing complementary day-glo dresses, the group were literally a bright spot amongst the usual array of visually dour indie acts. But that visual aesthetic coupled with the playful joy with which all four members perform belies the serious musicianship at work. On the band's best tracks, the interplay sounds like some lost jam session between Kurt Cobain and Thurston Moore. Bébé and Hirabayashi's guitar lines were constantly weaving in and out of one another, while drummer Mac Lawrie held everything together. 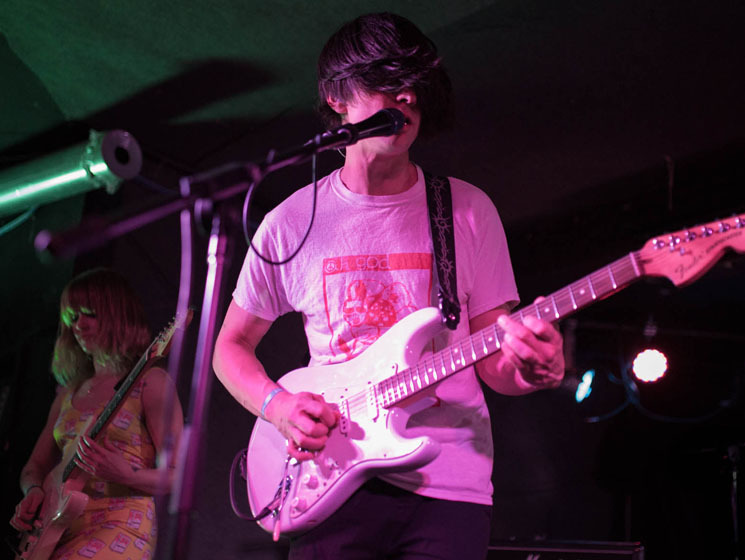 In fact, with the exception of a couple of long pauses, the band never really stopped playing — someone was always making some kind of noise, even if it was just Hirabayashi noodling on his guitar — which kept up the momentum across the band's entire set. Jo Passed "Star Song" / "Monkey Mind"